It is always imprudent to claim to imagine the future of a mode of expression that depends directly upon technical progress and is subordinate to the magnitude of its dissemination. Without going back to Louis Lumière, who told Georges Méliès that his invention had no future, you only need to read what was written about cinema around 1925-27. Critics and aestheticians considered it to be a specifically silent art, and the notion of a talking cinema seemed to them to be technically dubious and aesthetically contradictory. So without losing sight of such precedents, which ought to foster humility, let us still risk speaking about the future of television. Unquestionably, unforeseen technical variables could deeply modify the givens of the problem. Color will end up becoming standard, as might 3D, even if its recent failure leaves one thinking that the public had little use for it, at least when, against its nature, it is forced to emerge within the frame of a screen. Let's not forget that television does not exist in itself, any more than cinema does: it is nothing but perhaps a provisory form of contemporary spectacle. So one can hardly speak of it as one does of theater or painting, whose essences, beyond technology, remain human, hence eternal. In contrast, what should we say of a film rebroadcast in theaters on the big screen from a central broadcasting unit-would it still be cinema, or rather TV? Nevertheless, one should not let oneself be paralyzed by a futurist romanticism that is largely denied by the comparison with cinema and radio. If technology is a factor in revolutionary and unforeseeable progress some of the time, it is also, at other times, an unshakeable ballast. If one considers that the cinema was invented before the airplane and the radio, and that we are now in the atomic age, one will admit that its technical changes have been minimal in relation to those of our civilization. It is easy to theoretically imagine a cinema very different from the one we continue to content ourselves with, but at least half of the hypothetical innovations would necessitate the relinquishing of the current standard of 35 mm, fixed more than fifty years ago, rather arbitrarily, by Edison. In the same way, the perfection of the TV image is limited by its linear structure. There is good reason to predict that even if certain technical innovations allowed for the practical emission of a standard of, say, 2,000 lines, these inventions would remain in the laboratory stages where they would be unable to do what is economically untenable, i.e., render obsolete all of the current broadcasting and receiving equipment. From this perspective, it is reasonable to think that TV as we know it will last for a long time just the way it is. The only plausible progress for the years to come is the standardization of color, but one can admit that the transition will be smooth and that it will not overturn TV any more radically than it did cinema. Surely more important than its material progress will be the dissemination of TV, as additional indispensable relay stations are created. Let us then consider the aesthetic future of TV from its current technical state while assuming dissemination almost as great as that of radio. At the risk of disappointing the reader, I will first declare my skepticism as to the importance of the artistic revolution implicated in TV. More precisely, TV seems to me, like radio, to be an acquisition of great importance as a technology of reproduction and transmission, and it is in these that its principal vocation lies. If there exists a "radiophonic art," it does not seem to me to be at all comparable in originality to the traditional arts or even to a major "modern" art like the cinema. Radiophonic "specificity" does not seem sufficient to be the foundation of a true art, as it only plays around the margins. It is at most a supplemental factor in the aesthetic perimeter of the traditional arts that are transmittable by sound. In other words, the importance of radio seems situated more on the level of the psychology or sociology of art than on that of formal aesthetics. It is true, nonetheless, that the addition of the image changes many things and could make TV a major art with varied and subtle resources, like cinema. But that image, as I said, is relatively imperfect, and in all likelihood will remain so for a long time. This imperfection and the image's small size do not allow us to consider TV as a plastic art. The question is already debatable with regard to cinema, and even more so with TV. We do not ask that the image be beautiful, but simply that it be legible, and for this to be possible TV has to get rid of tiny details and characters framed from too far away. Should one complain about this? I think not; indeed this technical problem seems to me rather fortunate. Because of it, TV is condemned from the start to simplicity. Humility must be the main virtue of the TV director. He should not, of course, lack imagination, but all of the inventions of mise-en-scène must tend toward sobriety and efficacy. A clearly constructed and well-lit image-this should be the plastic ideal of televisual mise-en-scène. Beyond that, I would like directors to keep in mind that the qualities one expects from a theatrical performance on TV are the same as on a stage: we need good casting, actors who know their roles perfectly, who are imbued with them, and who have rehearsed a sufficient number of times to not bepreoccupied with the blocking. When these ordinary but essential conditions are fulfilled (too rarely, alas! ), the performance has already succeeded, no matter what style of mise-en-scène is adopted. This does not mean, however, that televisual mise-en-scène is a matter of indifference. Directing is adequate when it satisfies the traditional qualities of theater and the physiology of the television image. But it is better still when it takes into account television's psychology. I will not venture a definition of this psychology, but it includes at least one indisputable aspect, namely the intimacy experienced by the spectator with the characters who appear on screen. This intimacy can even become troubling, to the point of implying reciprocity. As for me, each time I meet one of the presenters of the TV news or even a TV actor in the street, I have to suppress a spontaneous urge to shake their hand, as though they knew me from having seen me daily in front of my screen. Transposed to the domain of televised theater, this remark means that intimacy is the privileged style of television. Practically speaking, this should be translated into a mise-en-scène that relies more on the actor than on the décor; and this could take us to the limit case of a mise-en-scène composed entirely of close-ups. Perhaps this approach would only be tolerable in drama or tragedy, since comedy requires more distance. Undoubtedly, great care must be taken with this approach. In any case, the notable experiment by Cl. Vermorel (Jeanne d'Arc and Andromaque) and the more recent, less systematic one by Marcel Cravenne (Le Malentendu) had enough success to allow you to believe that this is one of the rare laws upon which television directors may rely. Its application to theater, however, is but a particular case of a more general idea, that of "live transmission." Clearly this intimacy I speak of is as much linked to temporal presence as to spatial presence. In principle, this phenomenon is common to both radio and TV, but the perfection of sound reproduction makes the difference between the live and the recorded virtually indiscernible, except on certain news reports. On TV, however, there's generally no technical reason to prefer the recorded, and furthermore we don't yet have recording techniques perfect enough to make live and recorded material indistinguishable.Without a doubt this will come one day, and it will then be necessary to preserve in recordings the spontaneity of the live, since a great part of the charm of the TV image would disappear if one had the impression of finding oneself in front of a rebroadcast film. Cinema, thanks to montage, cheats with time. The aesthetic morality of television is, on the contrary, one of frankness and risk. We are talking about aesthetic morality, but also morality tout court. From this point of view, television is perhaps the most moral of all the mechanical arts. Even if "tele-theater," "telecinema," the "tele-varieties," or even the television news are hardly in the end more than an adaptation of other arts or means of information through the intermediary of TV, there is one domain in which TV outdoes all other arts, including the radio, namely that of human testimony, that is, individual revelation. One of the best TV programs is that of Jean Thévenot, on which he asks personalities from the arts, medicine, or letters to speak about themselves in front of the camera. Addressing the "average Frenchman," it shows that kings and shepherds, geniuses and simpletons are equal before television, in the same manner as we are all equal before death. This demonstrates that the TV camera is an extraordinary revealer of the human. Even if the mystery of photogénie is hardly ever mentioned today in regard to cinema, that of "télégénie" merits the reflection of both the psychologist and the moralist. It would doubtless be too simple, even ridiculous, to accord television the authority of the angel of the Last Judgment to separate the good from the bad. It is clear that certain people who are congenial in daily life would never "pass" on TV, and particular physical traits can be favorable or effectively disqualifying; but it is equally certain that "télegénie" is not a question of beauty, dexterity, or intellectual ease. Still, it always reveals, if not one or several moral qualities, then at the very least a certain human authenticity. One of the most revealing series from this point of view was that of Roger Louis dedicated to rural France. There, in every instance one saw real farmers discussing their professional problems. Now this is not a profession where verbal eloquence reigns, yet these people always spoke straight away and with a kind of authority that was fascinating. Indeed, even beyond the economic questions under discussion, this conversation constituted an astonishing human document. From this example one can imagine what immense and inexhaustible treasure is offered to TV. Such human revelation is perhaps its only specific function, its only truly particular vocation, but it is sufficient to justify its existence. Television maintains, first of all, a quotidian intimacy with life and the world, such that it penetrates every day into our living rooms, not to violate our privacy, but rather to become part of it and enrich it. Even more precisely, TV, in the infinite variety of its revelations, favors man. Each time a human being who deserves to be known enters into the field of this iconoscope, the image is made richer and something of this man is rendered to us. André Bazin’s writings on cinema are among the most influential reflections on the medium ever written. Even so, his critical interests ranged widely and encompassed the “new media” of the 1950s, including television, 3D film, Cinerama, and CinemaScope. Fifty-seven of his reviews and essays addressing these new technologies—their artistic potential, social influence, and relationship to existing art forms—have been translated here for the first time in English with notes and an introduction by leading Bazin authority Dudley Andrew. These essays show Bazin’s astute approach to a range of visual media and the relevance of his critical thought to our own era of new media. An exciting companion to the essential What Is Cinema? 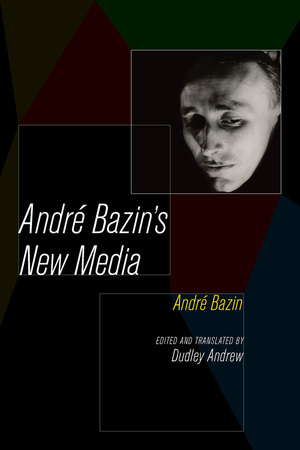 volumes, André Bazin’s New Media is excellent for classroom use and vital for anyone interested in the history of media. André Bazin (1918–1958) was the premier film theorist of the first century of cinema. Primarily associated with the journal Cahiers du cinéma, which he cofounded in 1951, he wrote for many other journals as well. Editor and translator Dudley Andrew is R. Selden Rose Professor of Film and Comparative Literature at Yale University. His books include The Major Film Theories, Concepts in Film Theory, André Bazin, Film in the Aura of Art, Sansho Dayu, Mists of Regret: Culture and Sensibility in Classic French Film, and Popular Front Paris and the Poetics of Culture. 5. The Talking Head: Must the Commissaire Stand on His Head for TV? 10. Long Live Radio! Down with the 8th Art! 14. Respect the Spirit of Theater First and Foremost! 24. Do We Really Need Those Serials? 29. Is Television a Degradation for Filmmakers? 31. Should Television Be Allowed to Chop Films to Pieces? 44. Cinema in 3D and Color: Amazing! 46. Will a War in Three Dimensions Take Place? 48. The House of Wax: Scare Me . . . in Depth! 49. The Real Crime on La Rue Morgue: They Assassinated a Dimension! 51. Will CinemaScope Save the Cinema? 56. Will CinemaScope Bring about a Television Style in Cinema?